My car was running on empty yesterday so I finally decided it’d be a good idea to get gas. I usually don’t wait for my car to ding me every single time I start it to refuel, but when gas prices only go up and not down, I dread my visit at the pump. Fortunately I decided to stray from my usual gas station, displaying a bold $4.39/gallon and instead stopped by a gas station down the same street where gas was “only” $4.19/gallon. I have no idea how gas prices can vary so widely from one gas company to another, but hey, my wallet is happy with the lower prices. Well, as happy as $4.19/gallon is going to make me. While I was pumping at this gas station I’ve never visited before, I noticed a large banner on the store window. It’s obviously been there for a while and is pretty beat up but you can still see what it’s for. I love how gas stations like to remind me while I pump gallons of gas in my car that my boys can also gulp down gallons of milk. 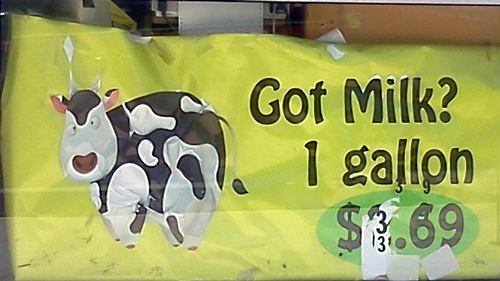 Besides the disturbing price display (it almost looks like $33.69/gallon), I’m a little concerned about the cow and its “inflated” state. Are they trying to tell me the price of milk is ballooning, or did this cow eat too much fibrous grass and is now experiencing a bad case of bloating? Either way, it looks like it’s ready to pop. Time to drive away!